Have you always wondered what it is like to swim deep beneath the surface of the water, looking up to see the light of the sun shining through the water? It is a truly impressive sight and experience to be swimming some 40 feet beneath the surface of the water, exploring the wonderful and mysterious marine world below. It is hard to imagine how beautiful and diverse the underwater worlds of the coast of the Bahamas are! Thankfully, the Bahamas are surrounded by warm tropical waters that make this one of the globe’s best destinations for scuba diving. Plus, it doesn’t get cold here! So scuba diving in the Bahamas is great during any season! 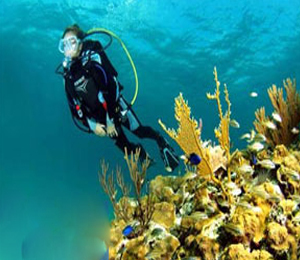 With our Bahamas Dive in a Day Resort Courses, people who have never gone scuba diving before and who are not yet interested in completing a full certification, now have the chance to go on an actual Bahamas scuba diving adventure! There is no certification required for these Dive in a Day Resort Courses. You will learn how to dive alongside one of our expert instructors by learning how to use scuba diving gear in a pool setting. Then, you will get to go on an actual open water dive with the instructor! 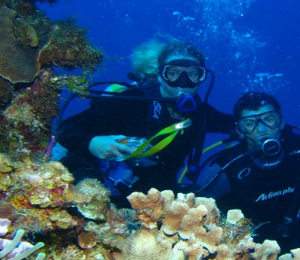 The Bahamas Learn to Dive courses are lead by our highly experienced team of PADI certified dive instructors. We work only with the most professional and passionate of dive instructors, both at our shops in Nassau and in Freeport Grand Bahama Island. We are dedicated to providing all of our Bahamas visitors with only the most high quality and memorable of Bahamas scuba diving experiences - and this applies for both certified divers and non-certified divers. We are the premiere diving and snorkeling center in the Bahamas, and we are eager to share the beauty of the Bahamas with our guests! This scuba diving course is for beginners and people who are not yet certified. The course includes an instruction portion where you will learn to use your scuba diving gear, followed by a one-tank dive at a shallow coral reef. This is an excellent way to discover what scuba diving is all about! The best way to go scuba diving in Freeport without your certification! The Freeport Learn to Dive Resort course offers you expert instruction in a pool setting followed by an unforgettable coral reef dive. If you have ever wanted to experience what it's like to swim 30 feet underneath the surface of the water, then this is the tour package for you!